The Covington Blues included some of the first Ohioans to volunteer for military duty with the United States Army during the American Civil War. At the start of the American Civil War, both the North and the South had to rely on individual states to supply the armed forces with men and supplies. In the case of Ohio, Governor William Dennison turned to the Ohio militia to provide the federal government with necessary troops. The Ohio militia system had been in decline since the end of the War of 1812. 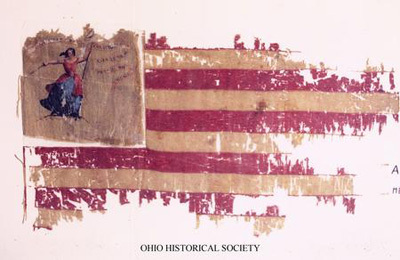 With Great Britain's departure from Ohio and the declining threat from Native Americans, Ohio citizens and their government had felt little need to support strongly this system for the state's defense. In April 1861, following President Abraham Lincoln's call for seventy-five thousand volunteers to end the South's rebellion, Dennison dispatched George McClellan and Jacob Cox to the state arsenal in Columbus to investigate the guns and other supplies that Ohio had on hand to help equip the militia units. The two men found some cannons that were unusable, old muskets, and other junk. Despite the lack of equipment, Dennison encouraged Ohio communities to revive the militia system and to form units that they would send to Columbus, the state capital. While the state militia system had deteriorated, numerous communities had maintained units. These units existed primarily to march in parades and to provide young men with something to do in their spare time. Among these units were the Covington Blues, originally organized in 1850. This unit traveled quickly from Miami County to Columbus, in answer to the governor's call. It became Company I of the Second Ohio Volunteer Infantry Regiment. This unit served as part of the first two Ohio infantry regiments organized for the war. Governor Dennison dispatched these regiments to Washington, DC, to protect the nation's capital, on April 19, 1861. This was just four days after President Lincoln's call for volunteers.